Graphics Shipping and Display Cases – Packateers, Inc.
To transport and display these samples, businesses use presentation cases. Presentation cases come in many sizes and most are made with a hard exterior to protect the valuable contents inside. Latches are fitted on to the case so that it can be tightly sealed. An extendable handle and wheels may be added to make it easier to move the case by rolling it along the ground. The interior of a presentation case usually has some kind of lining or cushion to pad objects placed inside and protect them from being scratched during movement. The foam inside a case can even be custom designed to match the exact dimensions of the product inside so that there is absolutely no room for movement. This type of lining is used for expensive devices like cameras to prevent damage during transportation. 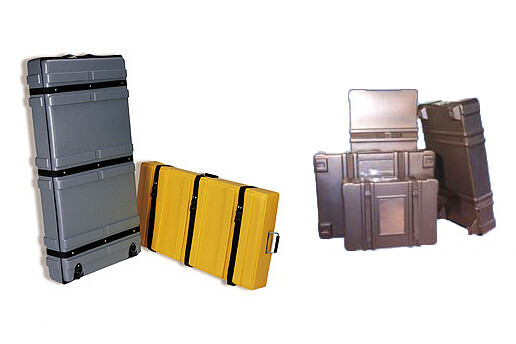 Expo Transport Cases – Packateers, Inc.
Large presentation cases have drawers and compartments within them to separate items. Since so many trade show exhibitors make use of presentation cases, some of them are made to fold open and be used as a temporary display for a product. The idea is to create a simple backdrop that draws people’s attention to the product itself. When the show is over, the case can be folded back up and easily moved to wherever it belongs. Combination or key locks are integrated into the latches of a case for security. Many businesses will have their company’s logo or address printed on the case to make it easy to identify or locate if it happens to go missing. 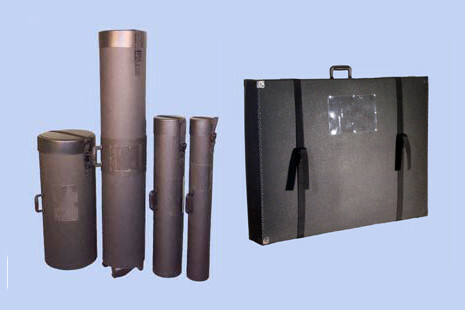 Presentation cases are used in many industries, including: military, sporting goods, agriculture, engineering, construction, fashion and more. If a company representative is making a presentation to a key group of potential investors, they may bring a small presentation case with them so that they can demonstrate their product or distribute samples. Sometimes this visual opportunity is what convinces people to invest in a new product. Presentation Cases When a product is brand new to store, or before it is even released to the public, companies like to show off samples that will spread the word about the unique benefits of the product. This is done in retail stores, at conferences, at trade shows, in business presentations or at other industry related events.